B1 provides areas for the location of small retail, restaurant, lodging and marine-related uses and residential uses within one or more of Scarborough’s beach communities. These uses are intended to serve the daily needs of the residents of the immediate neighborhood as well as tourist and summer visitors. This district encourages the evolution and maintenance of village and town centers within Scarborough that exhibit village style development and offer a mix of retail, office, service, civic, and residential uses in an environment conducive to both pedestrians and motorists. The buildings, parking areas, sidewalks, landscaping and other infrastructure within this district are to be of a village scale and character. 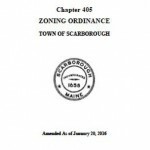 These areas serve as places for local shopping, business, dining, entertainment and civic activities primarily for residents of Scarborough and the immediate region. This district provides for general retail, office, service, lodging, and civic uses along portions of the Town’s major roadways. This district is intended to accommodate a wide range of non-residential activities that primarily serve the residents of Scarborough and the immediate region. As development and/or redevelopment occur within the district, the visual environment is enhanced, traffic flow and safety are improved, and provisions for pedestrians are made. Master planning for larger parcels, uses, and buildings, as well as mixed-use developments enable flexibility, creativity, conservation and residential uses in this district fostering areas of increased activity, vibrancy and sustainability. The Running Hill area is expected to develop as a high-quality, well-planned mixed-use center. This district is intended to accommodate a mix of office, service, financial, research, small retail, and residential uses in an environment conducive to both pedestrians andBO motorists. Development is intended to be compact and interconnected with common spaces, enabling walk-ability, human activity and vibrancy as well as convenient and orderly vehicular access and circulation. Master planning for larger parcels will enable flexibility, creativity, open spaces, and an overall character for the development. The RH2 district supplements the RH District in fostering a high-quality, mixed-use center, with development at a scale and uses at an intensity which are compatible with the surrounding area. This medium intensity mixed use district allows a range of land uses that are intended to complement the core development pattern and uses in the RH District as well as serve as a transition to the surrounding rural residential areas. This area allows for the growth and development of high quality office and research uses that result in the area becoming a major employment center. As development and/or redevelopment occurs within the district, the visual environment is enhanced, Route One is re-established as a “landscaped parkway”, and the Nonesuch River and adjacent wetlands are buffered from the impacts of the development. The purpose of the Crossroads Planned Development District is to allow a mix of uses, guided by design standards and a conceptual master plan, which results in a vibrant center for development located in the heart of Scarborough. This largely undeveloped area, within the center of the town, offers a unique opportunity for town representatives to work cooperatively with the area’s single land-owner, allowing mixed use development to evolve, while ensuring open space, preservation of natural resources, an efficient land use pattern for pedestrian, bicycle and transit use, a coordinated street plan and a cost effective extension of needed utilities. The mix of uses and efficient land development patterns are also intended to promote a number of community places, where people can gather, meet and cross paths. The land immediately surrounding the Haigis Parkway between Payne Road and Route One is unique in its topography, water features, visibility, accessibility and road frontage. Its proximity to Exit 42 makes it highly desirable as a regional center for employment, entertainment, and cultural activities. The Haigis Parkway District is intended to be one of the gateways into Scarborough, and anticipates high quality uses such as office parks, hotels, small scaled retail, convention centers, places of cultural and civic assembly, high technology and research, and multi-family housing as part of mixed-use development.. This designation allows the existing buildings in the industrial areas in Pine Point to continue to be used for manufacturing, processing, treatment, research, warehousing, storage and distribution, and other compatible uses until such time as the property is redeveloped and/or modified and used in accordance with the Town and Village Centers 4 (TVC-4) District requirements. The provisions of the I-O District are applicable only to buildings existing as of the date of adoption of this provision that are occupied or intended to be occupied predominately by uses that are not allowed as Permitted Uses or Special Exceptions in the underlying TVC-4 Zoning District. The purpose of this district is to provide an area for small, light industrial type of development while reestablishing the Holmes Road as an attractive gateway to the west side of town. New development together with redevelopment of existing uses should create an attractive business/industrial park environment with a roadside buffer along the Holmes Road. Residential properties along Two Rod Road and to the west of the district should be protected with a substantial buffer.